For 18 years, Pam Szmara has worked as an orthodontic dental laboratory technician where she fabricated orthodontic appliances for the dental industry through her company, Live Wires Orthodontics. When 3D printing engulfed the world of dentistry 6 years ago, Pam was forced to either adopt the new technology or be left behind. When one of her largest suppliers started carrying a Stratasys printer, she purchased one and began learning how to operate the equipment and fell in love with the process. This was the beginning of her newest venture, Pamton 3D Printing. With the advancements of 3D printing, Pam could now print the models for crowns and bridges for orthodontics, implant surgical guides, castable removable partial denture patterns, and much more. Pam started by servicing orders through word of mouth, but a year ago reached out to the Northeast Ohio Additive Manufacturing Cluster (NEOAMC) to gain access to resources that would help launch and grow her 3D printing business. 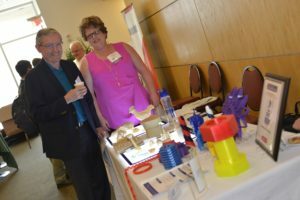 Pam learned about the Northeast Ohio Additive Manufacturing Cluster and attended the quarterly meeting to network with other like-minded peers in the industry. Because the Cluster serves as a mechanism to attract researchers, service bureaus, engineers, and users of 3DP, Pam quickly made connections to help grow her business. Being involved in the NEOAMC helped turn her small dental business into entirely new markets and materials. The Cluster keeps companies informed of what’s happening in the industry, provides members with introductions to technical experts and potential customers, and gives them access to new technologies. Additionally, by being a portfolio company at the Youngstown Business Incubator (YBI), Pam has been exposed to other opportunities like participating in the first training session on using the XJET Carmel 1400 Ceramic Printer, the only XJET printer in North America. In July of this year, the cluster held a one-day conference on materials for 3D printing at Cleveland State University. While exhibiting at the Advanced Materials for 3D Printing conference, Pam met Robert Joyce, CEO of FibreTuff, and executed a partnership. Pam agreed to use FibreTuff PAPC, a biopolymer material for Class I and Class II medical devices, and began making prototypes. After being pleased with the materials, Pam said she will continue to purchase materials from him. “I am seeking to grow sales for 3D filament for FibreTuff PAPC in the medical market and functional models of bone seem to be of interest. Pamton 3D Printing has been an excellent service center for the FibreTuff PAPC to help produce unique parts for both human and veterinary bone applications. This partnership has been a win-win for both of us,” said Robert Joyce, CEO of FibreTuff. “What I love most about the cluster is the partnerships that typically form between members. It is typical for companies to come together at meetings and meet each other and find ways to do business with each other,“ said Melinda McNutt, business development manager and membership director, NEOAMC.